We were hoping to recommence our weekend openings of the Studio/Gallery yesterday but everything got in the way. However, if you can forgive the mess we are in and make an appointment, we can still show you quite a lot of work and or anything specific you'd like to see from our Portfolio Pages. Currently, besides trying to produce new work and set up a new show in the Studio/Gallery, I am preparing a few pieces to be exhibited in conjunction with 4 other Blue Mountains Artists Network (Bman) members in a show called "The Elements". 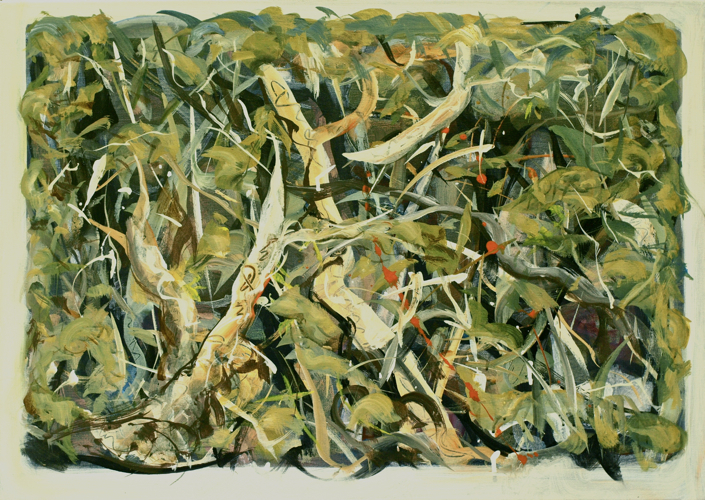 This show has been organised by freelance curator Susan Cochrane under the auspices of Bman and in conjunction with Blue Mountains Botanic Gardens at Mt. Tomah. It will open next weekend (Sat 4th March 2017) at 2.00pm. Adrian Gilbert Art Studio/Gallery supports Bman and will open as usual - 10.30 to 4.30 (every weekend) cnr. Easter & Holmes Sts Leura - just around the corner from Everglades House & Gardens. So, come up and enjoy the cold, visit a few galleries, stand around by an open log fire and drink wine, buy some drawings or paintings - check out the "Portfolios" pages on this website and see a lot more of mine. 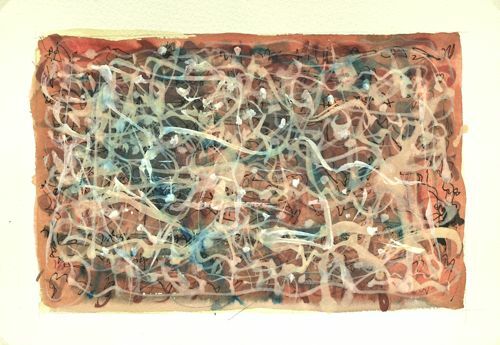 This piece below is one of about 30 works on display at present - but if you find something in the Portfolio pages you are particularly interested in, go to the "Contact Us" page and let us know before you come. If it's available, I'll have it ready for viewing when you come! "Left Behind by the Tide"
Acrylic paint on hardboard - approx 60cm x 130cm framed. "Essensual Form" is the name of the new show we've mounted here in the studio/gallery. Acrylic paint on gesso paper on MDF - 75cm x 108cm plus frame width. Acrylic paint on gesso paper on MDF - 108cm x 75cm + frame width. It's a wonderful thing; having my own exhibition space attached to my studio! It allows M and I to curate our own shows from stock while I continue to develop new ideas and themes in the studio. We generally mount 3 or 4 shows per year - each one with a different theme. 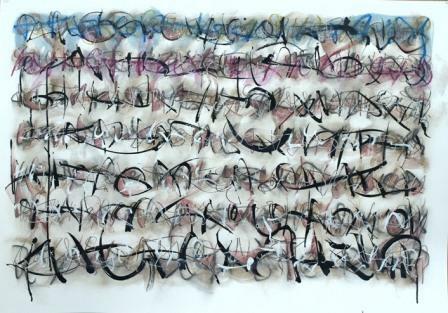 We've recently mounted a new show called "Writings on the Wall" in the studio/gallery . The work in this show mostly explores my love/hate relationship with words and writing on the subject of art. I particularly hate the way spin and artspeak are used in wanky explanations of things that either don't deserve or shouldn't need explaining. And because the creative process itself is always at least as important as any message, artistic licence allows me to push words and writing into simple calligraphic gestures and scribble - which, as far as I'm concerned, can be interpreted as "Blah, blah blah" - much the sound of this explanation. Nevertheless, besides making some surprisingly attractive works (better in the flesh than in these images) I think the value of pursuing these ideas has been in their contribution to loosening my attitude and approach to art in general. I'm now wondering whether all this isn't some sort of inversion of what originally inspired human development of language and writing? Acrylic paint on hardboard - approx 30cm x 45cm plus frame. 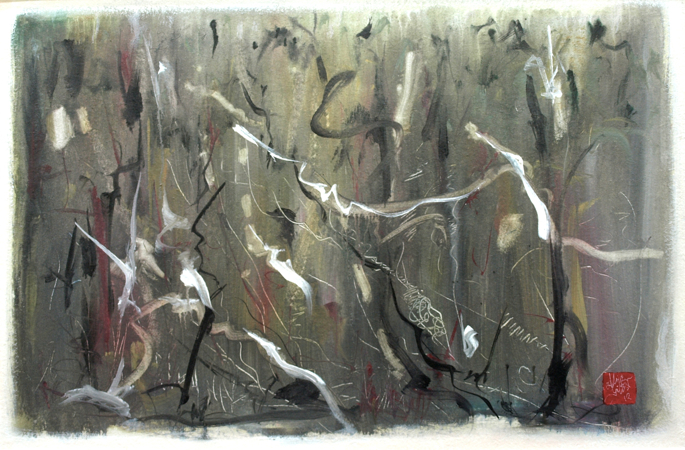 Acrylic paint on gesso paper - approx 15cm x 90cm plus frame width. Acrylic on particle board - approx 15cm x 20cm plus frame width. 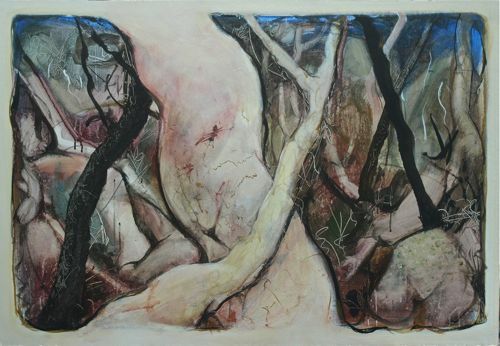 Acrylic wash on gesso paper - approx 50cm x 60cm plus frame size. Acrylic paint on particle board - approx 60cm x 90cm plus frame. 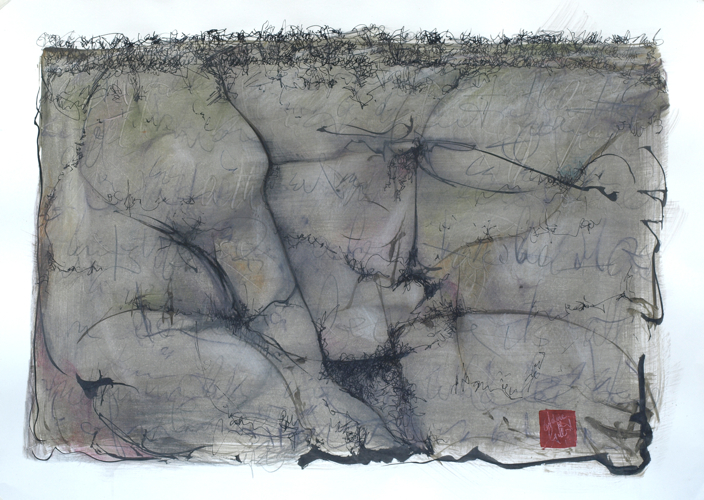 "Meditations on the Word II"
Mixed media drawing on aquarelle paper - 70cm x 100cm. 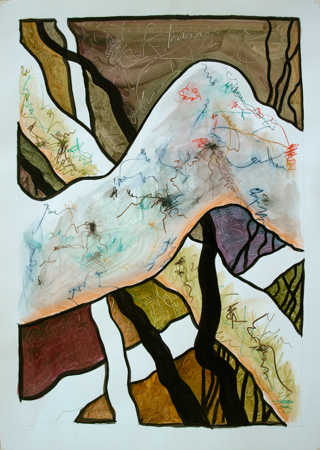 Mixed media on aquarelle paper - 50cm x 75cm - mounted with cream mat under acrylic sheet and framed in honey blond timber. 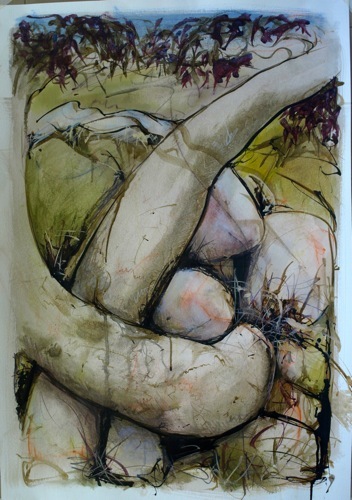 Total framed size, approx 72cm x 100cm. Acrylic paint on gesso paper on MDF - 75cm x 108cm plus 9cm white timber frame. Acrylic paint on gesso paper on MDF - approx 108cm x 75cm + 9cm white timber frame. Acrylic paint on gesso paper on MDF - approx 54cm wide x 75cm high + 6.5cm timber frame. Acrylic paint on plywood - approx 60cm x 60cm - mounted with cream mat surround under acrylic sheet framed in mottled and burnished silver/gold foiled timber. 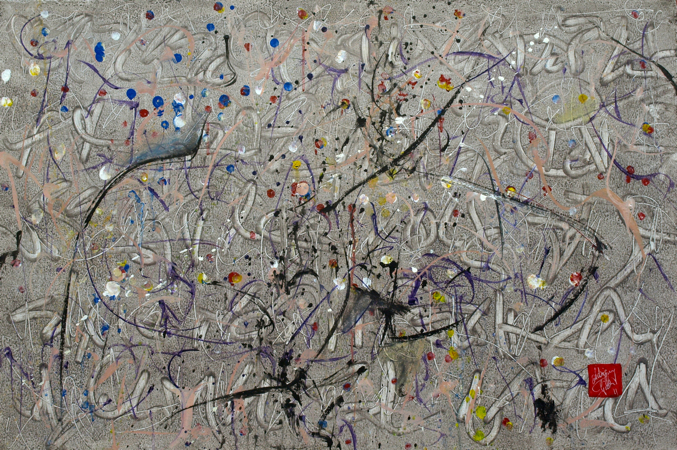 Acrylic paint on gesso paper on particle board - 75cm wide x 108cm high - framed in white timber. Total framed size approx 90cm wide x 123cm high. 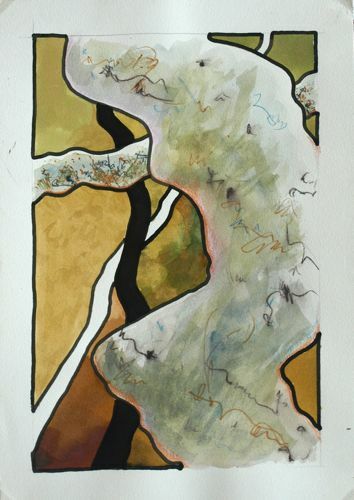 Acrylic paint and natural earth/ochre on aquarelle paper - 70cm x 100cm - mounted with cream mat under acrylic sheet and framed in 3cm wide timber, finished with burnished and mottled silver/gold foil. Total size (framed) is approx 100cm wide x 140cm high. You can see "Writings on the Wall" (currently including most of the above works) now or at any time over the next month or two or three. Just visit Adrian Gilbert Art Studio/Gallery on the corner of Easter and Holmes streets in Leura, Blue Mountains, NSW, Australia. We only open regularly on weekends and public holidays - 10.30 am to 4.30 pm or by appointment - or by chance if you find us at home. A good idea before you come is to check out the Portfolio pages on this website - and if you find something different you would like to see in the flesh, ring us on 47841600 in advance of your visit. If it's available, we will have it ready for you. Fancy "A Weekend in Blackheath"? Once again I'm taking advantage of my Blue Mountains Artists Network (BMAN) connections and support by putting together (at short notice) a pop up show called, "A Weekend in Blackheath". The venue is Virgin Walls, 251a Great Western Highway (2 doors east of the Gardiners Inn pub) Blackheath. The dates and times are: Friday 26th to Sunday 28th March - 10am to 4.30pm. So, we do hope you fancy - and will come and enjoy, "A Weekend in Blackheath"! And, for anyone wanting more: Adrian Gilbert Art Studio/Gallery in Easter Street Leura will be open over the same weekend (as per usual) with an entirely different show. Mounted with a cream mat under acrylic sheet and framed in timber finished in mottled green, gold and black. Framed size approx 70cm wide by 90cm high. 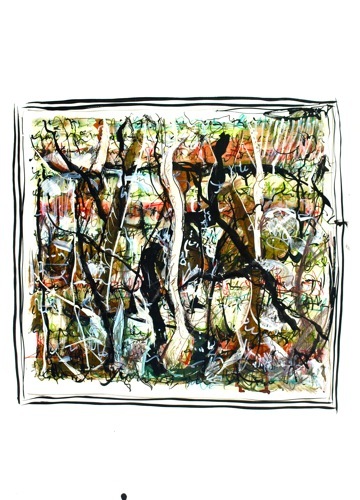 Taking advantage of Bman's connections, I've put 2 works in a show they've organised at Sassafras Creek Cafe, Kurrajong. One is featured below; "Forest Configuration 30" - representing an ongoing commitment to a particular creative approach I enjoy returning to from time to time. Kurrajong is another nice little village in the magnificent Blue Mountains area. It's a long way from Leura - on a section of the Old Bell's Line of Road at the bottom of Bell Bird Hill - just west of North Richmond - but if you are either coming from or returning to Sydney, you could make a round trip which takes in our Studio/gallery in Easter Street, Leura (open weekends & public holidays or at short notice if you ring 47841600) and Sassafras Creek Cafe for breakfast, morning tea/light lunch or dinner. Mounted with a 8cm wide cream mat and beautifully framed under acrylic sheet in a 3cm wide, mottled green/gold & black timber frame. Framed size approx 71cm x 91cm. 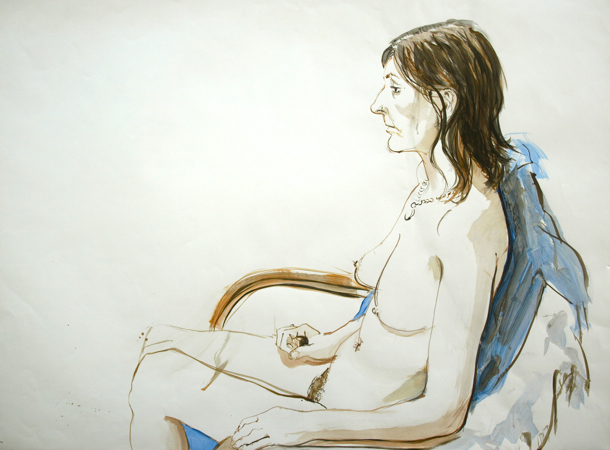 For those who are looking for a Life Drawing group in the Blue Mountains: the one I attend is in Katoomba - noon to 3.00pm on Tuesdays. We begin again on Tues 27th January and we are always looking for new participants - so ring Ken on 0413621307 or leave a message in the Contact Us box. I think I did the sketch below sometime last year - but I've only recently lightly developed and photographed it. "Here we go, here we go, here we go......."
Mixed media, quick sketch on paper - A3 size. It's weird how some of my favorite works are made to wait for years before being shown. It's not something I intend when painting them - but it generally happens because I've done something in them I'm not sure about and I need to see how it pans out over time. So they are put aside while I go on with other things. This makes them vulnerable to both being forgotten and being left behind; becoming more or less irrelevent to what I'm doing "now". Nevertheless, they sooner or later get rediscovered - and if they are any good, I'll look for an opportunity to display them. Having my own exhibition space now provides me with a great advantage in such circumstances - because I can make a show of older works (from stock or borrowed back for the occasion) where these forgotten and unshown pieces can be made to feel comfortable and at home. Such is the piece below - framed in a very old and very wide, hand carved wooden frame with a mother of pearl slip - on show now. 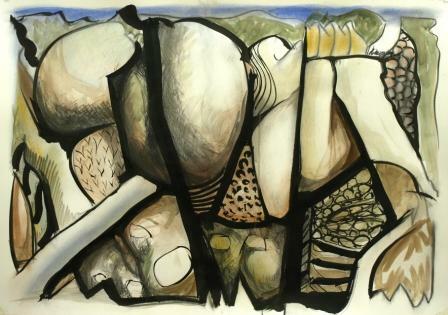 "Symphony of Stones" 1995 Acrylic on hardboard - approx 30cm x 60cm plus frame width. Spring again - and a new show in the Studio/gallery! So, Spring sprang before I was ready for it again. Have been trying to get my house in order at the same time as developing new ideas and work. Some of it is going pretty well I think - but it's too early to be sure. As well, there are other regular creative and productive routines one tries to maintain. Routines that are always on the edge of extinction because newer and bigger ideas seem so much more important. Then there's old ideas too! Suddenly one is reminded of, and distracted by, an older image: 'Have I finished with that? Hmmm, I think that theme/idea could be developed further................'! The image theme/idea below is one such - and it is now featured in our latest show in the Studio/gallery - but, going back to that question: I remind myself, 'Much of what I've done since this early 1990s painting IS a development of the same theme/idea. Indeed, I'm still trying to make the perfect image from the same stuff! It's just that one's 'approach', or one's way of thinking and working evolves..........................................................................or does it? Maybe it just 'revolves''? Acrylic on hardboard - 75cm x 90cm plus frame width. 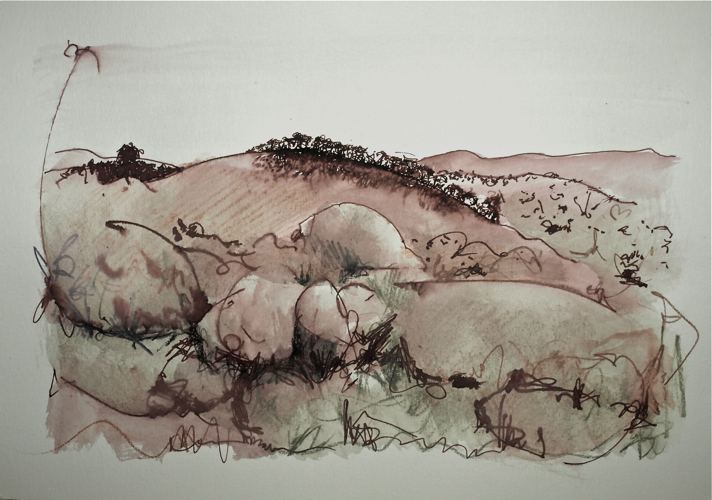 Original pen sketch on paper - from life - developed with watercolour and WC pencil. The act of drawing and painting in the pursuit of art can lead almost anywhere if one is open to suggestion. The main point of it is to find something you want to say and like the way you've said it! What you've said or how you've said it, doesn't really matter - as long as you like it enough - for whatever reasons. Whether others regard it as art (good or bad) is not your concern. Some will like it, some won't - and this will be the case whatever you produce. The most important aspect of this creative process is the act of tapping into your creative psyche and recognising what you are saying as truthful to you! If you are reflective, analytical and self questioning, you will probably experience a weevil of negativity suggesting what you've said is no more truthful to you than something quite different might be; that you really can't "know yourself" absolutely within this process or the results; cannot necessarily identify with the approach in question more than you might identify with various other approaches. Indeed, these things are equally true! Haven't posted for quite a while. Preoccupied with things other than art mainly. I have been doing a bit of drawing here and there - but for the purpose of this post, I'll include an older, 'developed' life drawing which I still find very attractive. "Angela Sleeping Out" circa 1996. Original acrylic brush sketch from life - developed into a painting. Acrylic paint on gesso paper - approx 50cm x 75cm plus mat and frame width. Like many artists, I have hundreds of life drawings in drawers awaiting some resolution to the question as to why I keep them. I mean, I keep producing more every time I attend a life drawing session - which I do regularly - partly for the fraternisation (it gets me out of the studio) and partly to "keep my hand in" so to speak. But it's actually quite rare that I frame such sketches up and exhibit them. I do go through the drawers about once every year and cull the worst drawings - but the collection continues to grow because it's so difficult to throw stuff out when one can see the immediate exhibiting potential or the potential for experimentation and development. The problem is, I have so many other ideas and projects to work on, I don't often make time to pursue those potentials unless someone commissions me to do so. 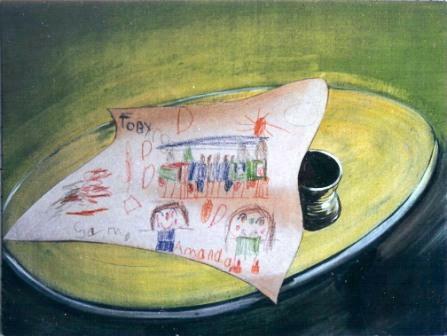 And of course, in their drawers, the drawings are "out of sight - out of mind". Yesterday a man came into the gallery with his grandson - about age 12. 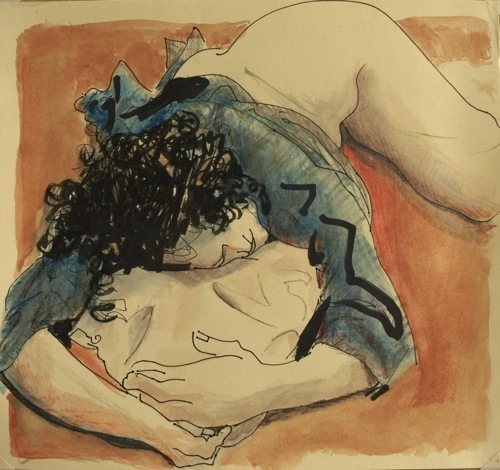 Currently on display, amongst a whole range of other works, are 3 small life drawing developments (eg. below) which drew a question from the boy, "Why did you paint these"? 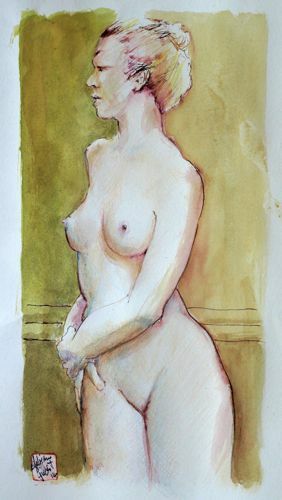 Before I could answer, grandpa - apparently thinking the boy was making some moral judgement of my propensity to draw & paint the female form - and so sensing a possible awkward moment for me - answered, "Why not"? The boy then explained his question by saying that, at first glance he thought this particular piece was a painting of hills. So I said, 'That's a good observation - and it almost answers your question. 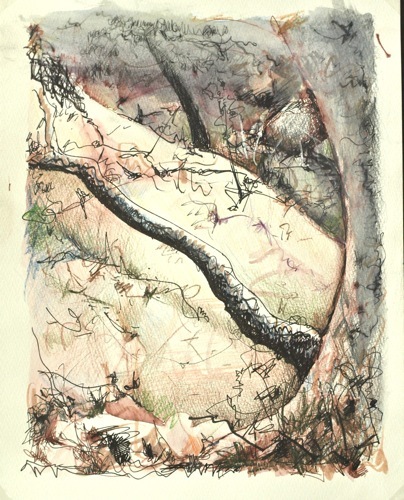 We and the hills are all made of the same stuff - and one of the things I'm most interested in drawing and painting is the sensuality of it all - of life'. 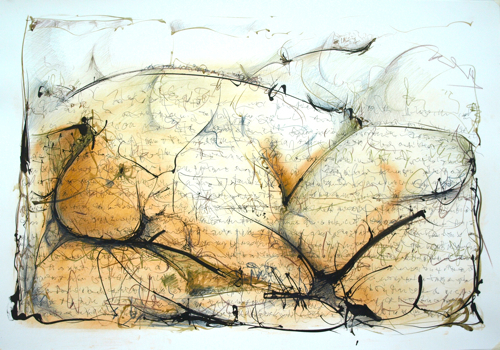 The title of the above work is a little bit cheeky, provocative and ironic - but it comes about because it is a "development" from an original drawing of a life model who goes by the name of Passion. Life drawing thisarvo. Kerri the model. Just a little ditty to fill today's post. Acrylic and enamel on hardboard. Now that the fire seems to be under control. Distractions, distractions! Fires, medical appointments, neighbourly interactions, website modifications, correspondence with collegues and friends (no, I haven't learned to use my face book account yet) general domestic duties - everything seems to conspire against maintaining a creative focus sometimes. Hmmm? Is their a pertinent image in my larder....................? A composition assisted by my 5 or 6 yr old daughter's artistry. Supposed to be with my Life Drawing group but a bush fire is threatening to burn our house - so I'm at home watching the situation. All is calm outside. Hope it stays that way while I test this blog system and sort out a few other IT issues. "Angst" was inspired by a conversation I was having with a couple of artist friends. We were discussing Brett Whiteley - who's work I much admired at the time - but one of us (Bill) didn't particularly like Whiteley's work and complained, "It doesn't have enough angst"! I went away thinking about this; wondering exactly what Bill meant. In the end I decided, the only way to ensure enough angst in a painting would be to paint a picture that was entirely about, and absolutely full of Angst. Bill never did comment on my comment - but I rather like it still. Will attend life drawing this afternoon. As usual, I'm wondering whether it isn't more of a distraction from studio creativity than it's worth as a regular discipline? But I remind myself that it's never ONLY discipline. Indeed, every session throws up at least one little idea to experiment with - and most sessions result in a good drawing or two. And it gets me out and about; stops me from becoming a complete hermit. 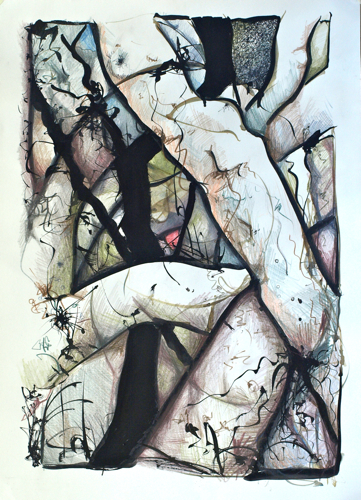 Mixed media on paper - 100cm x 70cm + frame. It's a question which inspires much of what I do. 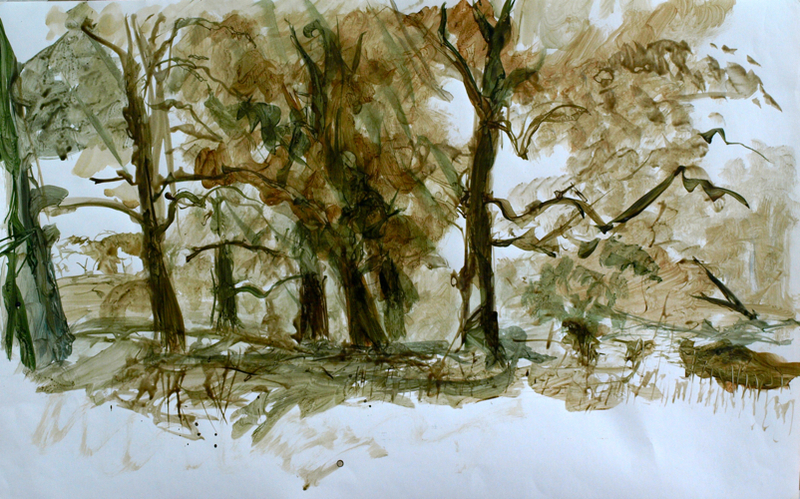 Sometimes the need to draw or paint figuratively is the thing - but inspiration is fickle. It can come from anywhere at any time and it won't necessarily comply with any notional rules about what sort of artist I am - and therein lies the diversity in my approach to ART. I think the encouragement of diversity is one of the great virtues of post-modern/pluralist attitudes in art. And, despite many reservations, I also think Marshal McLuhan and Andy Warhol were probably more right than wrong when they said, "ART is anything you can get away with" - and, as Donald Judd famously asserted, "If someone calls it art, it's art"! However, some of my reservations are evident within an equally valid assertion: 'If someone calls it rubbish, it's rubbish!' So, to all of these things I now add, 'this is because art is whatever we individually decide it is at any given moment'! Accordingly - for what it's worth, my own current definition is: 'Art is any object or performance imbued with qualities I associate with art'! - and I think this is as close to a comprehensively acceptable, verbal definition of art as I can get. Obviously all of these assertions are rhetorical - but mine are less aimed at convincing others of what art is (or is not) than they are aimed at providing me with some parameters for my own cogitations. ‘Reminders’ if you like – of who I am and what I think and believe - especially when I’m distracted by the logical sound of an opposing rhetoric. As I go on with this personal view of art, I expect it will become clear where my philosophical and aesthetic allegiances lie - but, I do hope readers will perceive there are many grey areas of thought and many overlaps of sentiment between what I claim to believe and what I actually do believe - as when confronted with artwork I think I shouldn't like, but do! For instance, even though I've always liked the idea of art forms which effectively undermine the pretentions and cliched beliefs of both the traditional and contemporary art worlds, my current definition of art actually excludes some forms of anti-art like Duchamp's "Fountain" - a 2nd hand, porcelain urinal - which, as far as I'm concerned, has no artistic qualities worth viewing or contemplating as art. It was originally a mass produced item, a utilitarian object with few artistic pretentions, if any at all. It was never meant to be seen as art - at least not until Duchamp presented it for display in an art gallery. Indeed, the original piece exhibited was so little valued (as art or anything else) it was destroyed after the show. What gets exhibited as Duchamp's work in galleries these days are mostly reproductions. And while it's amusing to see thousands of gullible "art lovers" now pay to go and see these reproduced banalities as they move around the world from blockbuster show to blockbuster show, I think the curators who promote such rubbish as "art" ought to be charged with fraud! So, unless there's some of Duchamp's more visually interesting work in a show, I find myself thinking, 'if I want to see a urinal, it's easier, cheaper and probably more interesting to just go to the Mens'! In 1917, Marcel Duchamp's display of a urinal in an art gallery was largely intended as a provocative demonstration of the way "context" (in this case, the art gallery itself) influences an audience's notion of what is or isn't art. If an audience automatically accepted the urinal as "art" simply because of it's setting in a gallery, then his point would be proved. No doubt a few people do perceive the urinal or Duchamp's idea as artful in some vague and pretentious way, but I'm absolutely certain that most of the audience at that time and since, has never seen anything particularly artistic in either. And so, the fact that this radical concept of recycling has since been written into the history of art as an important event, is really the only thing maintaining the fiction that it has any artistic value at all. Accordingly, it can only be accepted as art if we fully believe in the Warhol/McLuhan & Judd ideas above. As an art student and practicing artist who has persistently sought to understand what art beyond my own tastes and creative inclinations is about, I've learned to appreciate the breadth of what Duchamp contributed to modernism (or "post modernism" as it is now regarded) and since I was first introduced to it, have consistently appreciated "Fountain" as an intellectual gesture; an interesting bit of applied logic - but I've never been able to believe in it as art. And although the urinal in an art gallery idea has inspired many more such things (Damien Hirst's shark for instance) and provoked many important questions about the nature of art, I still think of it as an early send up of modernist academic pretentions - especially those promoting a quasi scientific basis for modern aesthetic ideas - and of course, a send up of those artists who simply subscribe to one fashion or another whilst claiming they are doing something original and important. And of "Fountain"'s ongoing fame as an art object, I continue to think of this as a wonderful demonstration of public gullibility (not necessarily individual gullibility though) in matters of art. Therefore, though I still believe Duchamp was a truly good artist who produced a lot of visually interesting stuff, I cannot accept "Fountain" - nor many other supposedly important pieces of post modern anti-art - as art! Obviously the idea behind any supposed art object may be more interesting and important than the visual interest generated by the art object itself - but I tend to think of such things, simply as "lesser", "failed" or "bad" art! In fact, I'm sure most people have always consciously or unconsciously felt this way about all artworks they find ugly, obscure or crass - especially if; to be appreciated at all, the artwork is depending on our sympathetic acceptance of some convoluted verbal explanation for its existance. Of course, as happened with "Impressionism", some forms of not quite understood visual art will no doubt become more and more understood, accepted and valued over time, but I suspect this will only ever happen if they are based in "appealing" rather than "appalling" visual aesthetics - and certainly not if they rely too heavilly on spin and the marketing of the ideas behind their conception. What we've really learned about art in the last hundred years - since Duchamp and other Dadaists opened the floodgates for postmodern ideas - is that, anything that's well marketed might be perceived as "art" for a while by some,- but mature minded people will seek out visual art which continues to appeal rather than date. However, I think there's little doubt that the objective promotion of postmodern ideas over the last 50 years is one of the main reasons why most non famous artist's work has become harder and harder to find collectors for - even as (and probably also because) our societies have become wealthier, better informed and educated. In most respects, being wealthier, well informed and educated is obviously a good thing. Indeed, it used to be (and to some extent still is) the case that art values and aesthetic veracity of all sorts were largely dictated by the prominent people in our societies - and until the mid 19th century, people of wealth, education and apparently "good taste" were really the only people who took much interest in art - so their ideas on such matters, though largely unexamined, were generally respected by the populace at large. Things started to change in Europe when burgeoning middle class sentiments began to question and undermine the establishment's values and supplant them with what were thought to be, proletarian ideals. This led to a new form of academicism which gave rise to the sort of art we've since referred to as "Modern". But early Modernism still promoted ideas about art based in absolutist ideals and aesthetic values rather than relative values - in much the way previous generations had - and it wasn't until the early 20th century that the philosophical questioning of these values by the Dadaists developed a visual coherency which demanded attention. Probably, the 2 hugely damaging world wars of the 1st half of the 20th century accellerated the changing values in our western societies - but it's only been the last 50 years of the 20th century and since that has seen the theoretical ascendancy of relative values over the earlier absolutist notions of things like "good taste", "beauty" and "art" - which is why it is now often said, 'in art, anything goes'! Despite these new ideals however, human individualism and self assertion being what it is, means - we all still seek confirmation that our individual views on art (and everything else) are absolutely correct anyhow - and so, amongst the plethora of opinions proffered as fact, we look for the authoritative voices which help sustain our own beliefs instead of questioning same. Unfortunately (from my point of view) such has been the success of capitalism and the popular cultural concepts marketed under its aegis, it seems most people now confuse fashion with art and take their aesthetic cues from pop stars, celebrities and other successful marketeers. Also in the last 50 yrs, we have witnessed and become part of an information revolution which now allows each and every one of us to question the way all art values have been explained by artists and historians etc. over the centuries. Indeed, I think; now that we can use the internet to gain information, we should all ask subjective/objective questions and seek answers to things like: 'Has art's importance in the scheme of things been overstated? Is most of what has been written about art by supposed authorities based in truth or opinion? Does contemporary art have any ongoing relationship with the original and simple concepts of art invented by our paleolithic forebears? (Indeed). What is art if it is not simply the expression of individual human creative desires and our reactions to the world we live in? How should all these different forms of contemporary art be comparitively evaluated? Should we value a work of art more because of the relative fame of the artist or artwork - and or according to the relative values that academics and other experts have employed to explain an artist and his/her work - or should we value a work of art more simply because of the way it appeals to our own eyes and minds in a personal way - without requiring someone else's verbal explanation?? And what bearing on these matters does the marketplace have? Is a work of art by a famous artist, valued in millions of dollars always better than one by Joe Blogs down the road that might be purchased for a few hundred'? Most people don't know what they like! They only like what they think they know! Having been an artist now for more than 45 years, it has become very apparent to me that, while public gallery attendances are up, general interest in non famous artists has diminished compared to when I began. For ordinary people, I think art has been very much devalued by overintellectualised wanking - especially in respect of anti art theory, practice and promotion. I also believe the whole concept of "art" has become confused and devalued by the persistent promotion of crudely made and presented anti-art ideas including POP, Punk and all the kitschy novelty ideas which our young artists are being encouraged to pursue. Punk art for example, was initially conceived to be so ugly as to shock us out of our tasteful complacencies - but now it subscribes to a particular set of aesthetic values which, like kitsch, has been adopted as high fashion in our youth centred market places - consequently, turning many (but not all) conventional notions of "good taste" and "beauty" on their head. However, I think the promotional success of punk and kitsch merely demonstrates the superficiality of most peoples aesthetic understanding - and this of course is reinforced by the fact of "fashion" being a major driving force behind so much human industry. However, within our postmodern world there is quite a lot of good art too - but so concerned with hyperbole is today's media - and so concerned with fame are so many artists and commentators, it is much easier to promote an outrageous idea or image as art than something genuinely appealing. Indeed, over the same 45 year period, this sort of art promotion has created a 'fashion art' market for all sorts of rubbish amongst those with high disposable incomes; people who are more likely to pay far too much for something they think of as a status symbol - as "cool" and fashionable - whether they perceive it as 'truly wonderful' or not. So, buying art for the wrong reasons isn't a new phenomenon, but trying to sell it again within a few years when it seems dated, is! Quite obviously, I don't automatically equate fashionable ideas with good art. Probably, a lot of ideas which have instigated a fashion are artful in some ways, but I think unquestioning subscription to popular ideas generally shows a lack of imagination and or aesthetic sensitivity. To subscribe to a fashion concept in the hope of becoming popular may well be a natural human inclination, but it is hardly indicative of a truly strong, individual character - especially when the fashion is already subscribed to by the majority of one's peers. However, I also think that these things don't really effect our mature human ability to quietly and privately experience a work of art which seems to convey some sort of genuine insight into the nature of being human and or some sort of eternal sense of truth and beauty. And though producing truly beautiful art has no doubt become more difficult in our post-modern times (probably because we actually need to believe in some notion of eternal truth and beauty to perceive such) whatever it is will somehow need to avoid most of the aesthetic and conceptual pitfalls generated by ego, selfconsciousness and the arty cliches which pervade artist's and audience's thinking as much today as ever. Indeed, it is a strange time in human history. A post modern understanding of the world makes "relativists" of us all! Pluralistic ideals encourage us to recognise and accept that individual notions of truth are always related to individual beliefs which should be respected - but, to a large extent, we all continue to vehemently argue or fight for what we want to believe and against the things we don't want to believe! Accordingly, so that I may work freely in the way I want to work - I believe that, despite the evidence of popular opinion (which only suggests my ideas are shared by far fewer people than the followers of one fashion or another) more sophisticated adult minds continue to seek truth and beauty in art beyond the cliche and beyond what's merely fashionable and novel. In fact, despite my cynical side also - and the new ideas and forces of change I've always flirted with - I still believe in a particular feeling I've always had; that there is a universal sense of beauty - a sensual appreciation of life which all humans share. And for me, this sense of beauty is still more readily explorable and expressable within the traditions of drawing and painting than in any other approach to visual art. 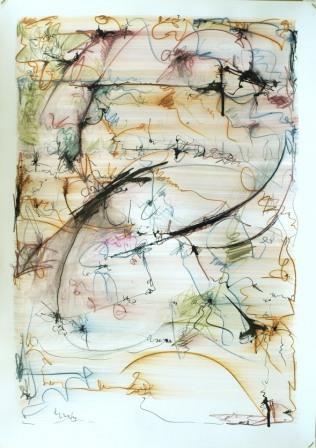 This is not to say of course, that drawing and painting are the only approaches to art which can provide such qualities - but they still are amongst the most direct and technically simple processes with which we humans might explore our creative faculties. Beauty is in the mind of the beholder? "Beauty" is an abstract concept - almost impossible to pin down because it is perceptually fugitive, conceptually transient and sometimes masked by distracting characteristics. However, I think it can still be found as often within strong, figurative artwork as it might be in any abstract or semi-abstract approach. It is very important to try to avoid arty cliches because they get in the way of fresh responses - but probably more important still (for us artists at least) is to recognise and accept something of ourselves; particularly our natural creative inclinations - rather than trying to be like some other artist or even trying to avoid being like some other artist. "Beauty", like art itself, is an honest quality. A quality which seems to make itself apparent when the artist relaxes his/her ego based desires and demands - and it certainly doesn't manifest as a result of applying theory or obeying rules. Indeed, like weeds growing in the cracks between barren paving stones, the best art appears in gaps in the logic - between different verbalised concepts, theories, formulas and rules. And so, in the end, I believe all verbal descriptions, interpretations, explanations and definitions (including my own) to be far less important than just looking at art and feeling something special emanating from it. Problematically though, it seems the rise and rise of Pop culture, combined with new media technology and the pretentions of our post-modern art world, have promoted the reverse. We now have a media driven art world where Warhol's prophesied "15 minutes of fame" for everyone is actively pursued by almost everyone; commentators, artists, curators, dealers, collectors et-al - and even many in the audience too! Everyone who is trying to make a living from art - and those who feel it's important to be seen as "cool" and "part of the scene"! And I believe this sort of shallow public engagement with art is almost entirely a result of the authority our society has vested in the written or spoken opinions of celebrities as much as supposed art experts - few of whom have ever made any noteworthy art themselves - and some of whom have vested interests in convincing us that black is white!. Indeed, perforce of these people, the situation in the art world now is: if no-one is talking about or writing about something purporting to be art, such art is deemed to be next to worthless! Spin and marketing rule - OK?! NO, it's not OK! It's true enough - but it is also most unfortunate for art and our communal aesthetic sensitivities!! Moving to the particular; believing what I do about art in general, it would be nice to feel as if my "Wild Assertions" series (eg, above) and other word/writing based ideas - will be easily appreciated - without any need for verbal explanation - but I know that's not likely. And though I would rather people make up their own minds in respect of what such work is about - I also know, some want or need an explanation. So here goes: In my word/writing based artwork, all of these ideas (and more) that I'm writing about here - have been thought through and played with intellectually; sometimes using key words, phrases or well known texts - at other times, a sort of calligraphic scribble or make-believe "writing" which can be simply interpreted as "blah, blah blah". And, although all these things have an objective graphic quality, they are also, to some extent, emotionally driven responses to my feelings that art is drowning in verbiage. Apparently I've needed to invent a process which might visually express both the simplicity and labyrinthine complexity of all the issues - as well as the irony and the irritation I've long felt about the time I've spent thinking/writing about such things instead of just drawing and painting - but especially the irritation I feel when celebrities and or pompous professional arts commentators present cliched ideas, personal views and promotional spin about art, as factual truth. And then there's the recently fashionable notion that "text" in paintings - especially if it relates to current social or political issues - somehow makes a work more profoundly meaningful as visual art. What is it with all this verbiage? Are we no longer expected to experience art visually? Do we need to be taught to read Chinese or Japanese languages to appreciate beautiful and expressive calligraphy - or be fully briefed in aboriginal culture to perceive the graphic wonders in their paintings?? Such contextual information can no doubt add an extra dimension to our appreciation - but unless we find the works themselves visually compelling, it smacks of putting the cart before the horse; relying on a verbal explanation to provide most of the interest in something we might visually overlook or dismiss as worthless. For me, the ART value of work like "Wild Assertions", lies partly in the inherant ironies of this explanation/protest, partly in the instinctive creative processess I use to make each piece - and partly in their visual aesthetic virtues as objec d'arte. And I can assure everyone who reads this, the irony of my making these notes and running this blog is not lost either. Indeed, it too might be ART - but except for the imagery, hardly "visual ART"! PS: The above is by no means a full and accurate explanation of anything I think and believe - but it does reflect many of my current feelings about such things as I've mentioned. More interestingly though; the sort of mark-making featured in "Wild Assertions" seems to be evolving as an important part of my general creative/aesthetic interests. It currently informs much of what I find myself doing within other, more conventional approaches to drawing and painting - and this is creatively reassuring. Art is such a strange, complex and unpredictable animal, I'm not at all sure where it will take me. But of course, that's half the fun! And maybe the other half is, thinking, talking and writing about it?